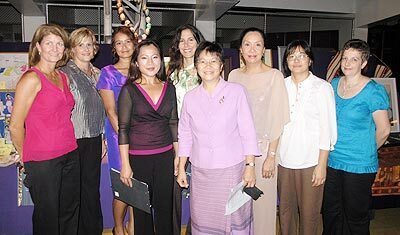 The co-organisers of the CMIS fundraiser, Tuyet Cahill (4th left) and Khunying Pimjai Kupadakuinij (3rd right) are all smiles after a highly successful event. The doors were thrown open at Chiang Mai International School (CMIS) on Friday, November 21 for its major fundraising event of the year. A silent auction took place, organised by the Parent- Teacher Group (PTG), with items being donated mainly by the parents, teachers and students themselves. Tuyet Cahill, co-chair and PTG president, told the Chiang Mai Mail she was amazed by the support of everyone involved, and wanted to say a special thank you to the Amari Rincome Hotel who catered for the event at a special price, and an even more special thank you to all the parents and guests who came to bid on the items, helping to raise a whopping 240,000 baht. The proceeds will be donated to CMIS to help pay for a new basketball court roof. The court, or sala, serves many purposes for the students and the new permanent metal structure will provide the children with better shelter from both the heat and rain. The Asmase staff had a great time at Agape Home with the kids. The insert shows the 7 year-old boy who won everyone’s hearts with his cheerfulness and fortitude. Right next door to the Chiang Mai Mail’s offices, on the ring road near Rimping Mee Chok, you will find the office of Asmase, an IT design and hosting company which also houses a law firm and one-stop business solutions centre. If you visit the company, and talk to its Dutch owner, Georg Westenbrink, you will be told a very touching story of how a project dreamed up by a caring owner and his employees resulted in many children in a local orphanage, including one very special little boy, enjoying a wonderful day, with hopefully many more to come. The scheme is simple – whenever an employee has a birthday, he or she is invited to choose as her birthday present a charity which will benefit, and to decide what it needs. 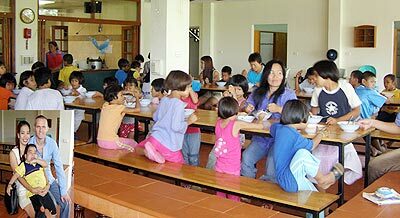 When it came to her birthday, Asmase’s office manager Khun Lek decided to do some research and discovered the Agape Home. She arranged to go to the orphanage and find out what they would like. The result was a great lunch (followed by ice-cream of course) for 80 children, and all arranged with a local catering company. The rest of the Asmase staff brought many other items that had been requested, including toothbrushes, candies, biscuits and toys, and delivered them on the big day. Everything was a huge success, with the kids a little shy at first but full of interaction and enthusiasm by the time the toys and the ice-cream were handed out. Many of the children have HIV/Aids, or some other serious health problems; one little boy in particular attracted everyone’s attention with his cheerfulness. The staff at Agape Home told Georg that the 7 year-old had a congenital disease and would possibly die quite soon. They also told him the child knew his situation, yet had never been anything but accepting and happy. He became all the Asmase staff’s special favourite, and won their hearts completely.